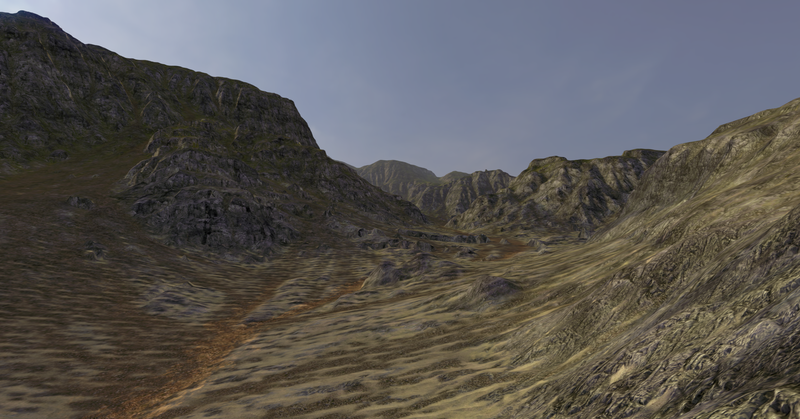 This entry was posted in Volo and tagged screenshots, terrain, world machine on April 10, 2014 by mzandvliet. I haven’t streamed anything on Twitch yet this week, my apologies. We now have a discussion forum though! Come chat about the game, share screenshots and videos, and gently nudge me about making new builds. I went to Indievelopment on Monday. The event wasn’t as interesting as last year (it was heavily geared towards students this time around, and talks had less oomph), but I had a good time with friends nonetheless. Drinks and discussions on ludology make for a good evening! I spend an afternoon doing a code review for the work Frank has been doing. As mentioned last time, he has worked on the new GUI system and some other parts of the game. His style of programming is very different from what I’m used to (functional, as opposed to my mostly imperative approach), and we’re learning to find a middle ground. The heartbleed bug in OpenSSL also prompted us to perform some updates on our servers, and to actually force blog administration to use HTTPS. I feel just a little bit more secure now. Anyway, that finally lets me back at actual game development. Let’s code! This entry was posted in Uncategorized on April 10, 2014 by mzandvliet. No development stream this week, though perhaps on Friday. Turns out our hosting agreement was due for renewal, and we took this time to make the switch to much more flexible cloud-based hosting. This entry was posted in Programming, Uncategorized, Volo on April 2, 2014 by admin.